You know your preschooler wasn't raised in a barn but how do you convey that to anyone that eats with her? Chewing with his mouth open, eating with her hands, burping, the list goes on and on. It's no wonder that dinner time in many houses where ​with a child under five becomes a cringe-worthy event for most parents. The good news is, teaching your preschooler manners is not a difficult proposition. Ready to learn and eager to please, most preschoolers will be very receptive to introducing table manners to their dinnertime routine. The key is in your method. Focus on teaching a specific manner one at a time so your child doesn't become overwhelmed and confused. Before you start, it's important to remember that you are your child's best role model and anything you say or do is likely to be repeated by your mini-me. Make sure you are practicing good manners at the table. By setting a positive example yourself, your preschooler will soon be displaying behaviors sure to make even Emily Post proud. If you tell your preschooler that you want him to practice good manners when he eats, it's likely he won't know what you are talking about. Explain that manners are a way of showing kindness to the other people at the table, whether he is eating at home, in a restaurant or in someone else's home. Say that manners are rules for the table and it's a way to show everyone, including mommy and daddy, what a big kid he is. Good manners start before you even reach the table. First step – hand washing. Talk to your child about washing her hands and how she should do it before every meal and snack. If your child is under 5, this might be something you want to help them with. In any case, kids should be scrubbing with soap under warm water for about 20 seconds (have them sing the ABCs or "Happy Birthday" twice). To reinforce this behavior, make sure your kids see you washing your own hands before you eat. In fact, join them at the bathroom sink before you sit down. If a prayer or blessing is part of your dinnertime routine, explain to your child what you are doing. Tell her that once the prayer is finished then it will be time to eat but while you are praying there is to be no talking or eating and that he should sit quietly. If your child helps say the prayer, be sure to practice it with him ahead of time. There are lots of teachable moments while you are dining. For instance, if your child reaches across your plate for the potatoes, say something like, "I'm glad you are hungry, but next time remember to ask for the food and I'll be glad to pass it to you." Then model the behavior yourself. By age 3, your child should be eating with a fork, but sometimes they do regress. Plus, it is confusing. Some foods are OK to pick up – think corn on the cob, chicken nuggets or cheeseburgers – while others are definite "no's" – rice, peas, and applesauce. Don't assume he should know better, just gently point it out if he's made a mistake. "Daddy does a great job of using his knife and fork, why don't you try that instead? It might be easier for you." You may also have to teach your child to use a napkin instead of her sleeve or shirt. By age 3, she should be done with bibs and be able to wipe her hands and face, but be sure to show her as well. When your child is done eating, make sure they sit in their seat until you say it is OK. It may be hard for a little one to sit through until everyone is finished eating, so as long as he's eaten enough to your satisfaction, let him go do something else. Teach him to say "Thank you for dinner," and show him how to bring his plate, cup, and utensils over to the sink. Some behaviors at the dinner table shouldn't just be classified as not having manners – they are just in poor taste! The problem is that many of these actions are also big attention grabbers, so be careful as you discipline. Correct the behavior, particularly if it's one he's exhibited before, but be aware your child may just be looking for a reaction from you. Is there anything funnier to a preschooler than a burp? Probably not. Remind your child to close his mouth before he burps and to be sure to say "excuse me" afterward. One of the causes of a burp could be is that your child is eating too fast. Make sure her food is cut up in small pieces. At around age 5, your child is ready to use a butter knife. Teach her the proper way to hold it. Teaching your child to use a fork and knife correctly may also prevent them from playing with their food, a popular mealtime stalling technique. Whatever she is doing – blowing bubbles in her milk, launching peas at her baby sister – remove the item in question and tell her if she keeps it up she will no longer be able to sit at the table like a big girl. Another parent non-favorite is when kids chew with their mouth open. This is a little harder to correct because it's a learned behavior. If after a few reminders you can still see what your child is eating, try bringing a pocket mirror to the table and showing your child what he is doing and how yucky it looks. 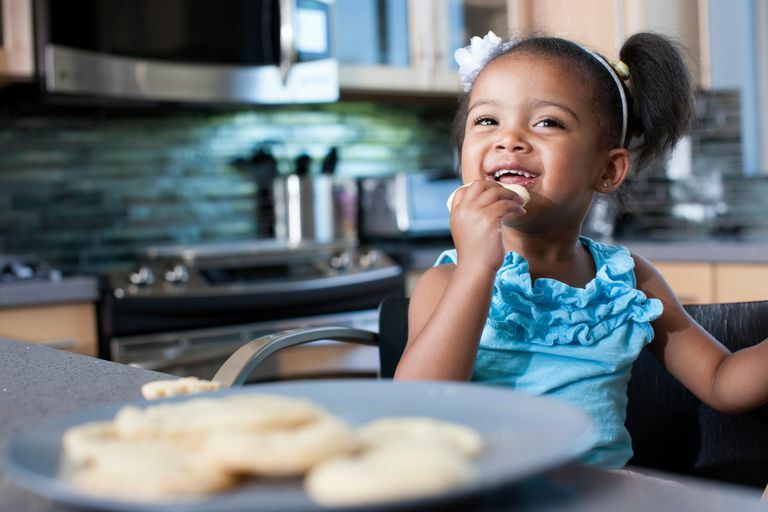 If your child talks with his mouth food, a simple reminder to "Chew and swallow first, then talk," should do the trick. Some children spit their food out, especially if it is something they do not like. This is a big no-no. Tell your child once he puts something in his mouth he is to chew and swallow it completely. Proper manners isn't just about saying "please" and "thank you" (although they are a big part of it), it's also about teaching your kids what not to say. Children this age don't have the ability to filter what is appropriate to say and what isn't, so chances are if they don't like what has been put in front of them to eat, they will be vocal about it. Luckily, the ability to think first and speak later will come with age and practice. Teach her the adage, "If you can't say something nice, don't say anything at all." Explain that when she says something mean about the food or makes a rude face, it can hurt the feelings of the person who did the cooking. Instead, teach them to praise what they did like about the meal. Family dinnertime is a great opportunity to gather everyone together at the end of the day and share exciting events and news. Your preschooler will be excited to take part in this daily ritual and no doubt bring something interesting to the conversation. It's important, however, that he learns to wait his turn to speak. This can be a very difficult concept for children this age to understand, so it may take some time. Say, "I need you to wait one minute while sister finishes her story. Then it will be your turn." The one exception to this rule is if she needs to go to the bathroom. The most important rule of teaching your little one manners is that it's OK if he makes mistakes. Learning and showing manners is something he'll do over the course of his lifetime, so as long as you teach him the basic skills and work to improve on them, he'll be confident in social situations as he gets older. Maybe one day he'll even thank you!.